AndhaDhun starring Tabu, Ayushmann Khurrana and Radhika Apte has intrigued one and all since the start. 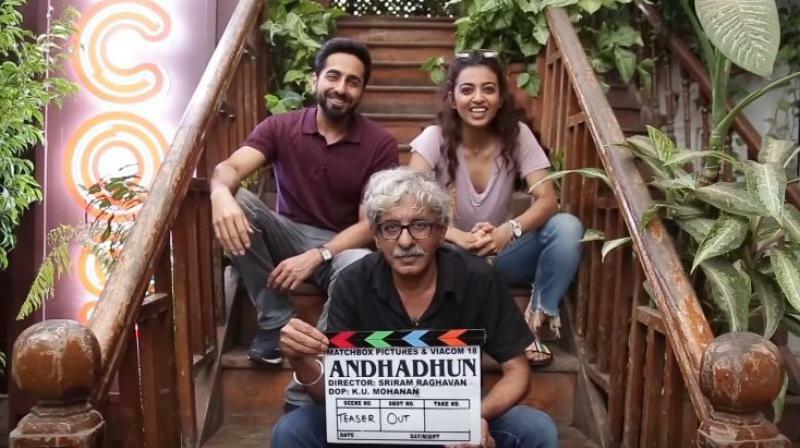 Ayushmann Khurrana, Radhika Apte and Sriram Raghavan in 'AndhaDhun' announcement video. From making audiences guess the name of the film to the trailer making a mark, AndhaDhun is already the next hot thing! Coming to hotness, a still from the movie has been leaked where Radhika Apte looks stunning hot. Staring in the mirror wearing pink aviators and striped dress with deep neck, the actress appears all bit sizzling! A red lipstick just completes her look. Radhika Apte's leaked still from AndhaDhun. From the looks of it, Radhika’s leaked still might be that from an upcoming song from the film which also sees Ayushmann Khurrana as a blind piano player. Radhika Apte plays his love interest and the suspense around her character has been kept intact, thus making audiences eager to know more about her. The actress is currently having a great career high and is omnipresent to put it straight as she has been part of projects like Ghoul, Sacred Games, Lust Stories and now AndhaDhun, all of which are in the buzz even now! Also starring Tabu in the lead role, AndhaDhun, directed by Sriram Raghavan, is all set to release on 5th October 2018.